The supranational body entrusted by the world to negotiate a peace agreement between Israel and the Palestinians, known as "the Quartet," has proven itself unworthy of that trust. I refer not to the "Arab Quartet" consisting of Egypt, Jordan, Saudi Arabia and the UAE, which in the current climate might actually be fairer to Israel than the other Quartet, consisting of the European Union, the United Nations, Russia and the United States. Sometimes called the "Spanish Quartet" or "Madrid Quartet," it was named for the 1991 Madrid Conference, which was the first step in the disastrous Oslo peace process that has increased Palestinian violence and harmed Israel. For different reasons, each of the four Quartet members is unqualified to negotiate an Israeli-Palestinian agreement. Half of the Quartet (the EU and the UN) has elected to champion the Palestinian cause and vilify Israel, and the other half has at least temporarily abdicated the moral ground necessary for the task. 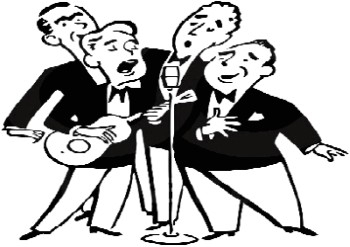 The time has come to disband the Quartet. Each of the four Quartet members is unqualified to broker Israeli-Palestinian peace. During the First Gulf War, the fragile coalition of nations that liberated Kuwait and defeated Saddam Hussein remained together only because Israel did not fight back when Saddam launched scores of Scud missiles at the Jewish state. George H.W. Bush's administration had given Israel Patriot missiles but pressured it not to retaliate for fear that Arab and Muslim members of the tenuous coalition would refuse to fight against Saddam if Israel was also fighting against Saddam. At the close of the war, the apparent cooperation of Muslim and non-Muslim nations boosted optimism at the UN to an all-time high, and the moment seemed right to capitalize on the goodwill and solve the Middle East's most enduring conflict. And so the Oslo process began, with the Madrid Conference. When president Bill Clinton's final Camp David push for a solution failed, Arafat launched the so-called second intifada and the Oslo era was over. After 9/11, George W. Bush signaled that the US would no longer pressure Israel to make concessions the way it had under the Clinton administration. This led to the creation of the Quartet, a compromise of sorts introduced in 2002 to spread responsibility for advancing the peace process among the four most important players in the Middle East. But an examination of each of the four reveals that none is an objective arbiter in an Israeli-Palestinian peace agreement. When not involved in promoting the Boycott, Divestment and Sanctions (BDS) movement, attempting to sanction Israeli citizens, or labeling food from Israel (all the easier to boycott), the European Union (an increasingly oxymoronic term) is busy negotiating its own continued existence. It has never been a neutral arbiter in Israeli-Palestinian negotiations. 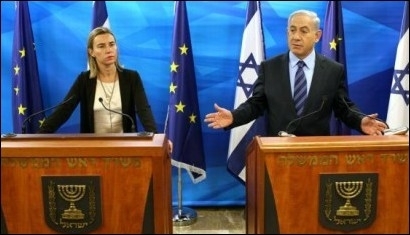 Israeli Prime Minister Benjamin Netanyahu meets with EU foreign policy chief Federica Mogherini in Jerusalem in November 2014. Jennifer Rubin noted three years ago that the EU "strives for relevance but its anti-Israeli tendencies make it particularly unsuited to play any constructive role in the Israeli-Palestinian conflict." The EU was also instrumental in the UN's International Court of Justice's (ICJ) denunciation as illegal Israel's wall that ended the wave of successful Palestinian suicide bombers. Its statement on November 18, 2003 determined that the wall had effected a "de facto change in the legal status of Palestinians," and Irish MEP John Cushnahan declared that "Palestinian land has been confiscated to build the barrier." Fortunately, the ICJ's rulings are non-binding, including the order for Israel to compensate the Palestinian people for inconveniences the wall had caused. Like the EU, the UN has been reliably in favor of the Palestinians and opposed to Israel ever since it voted to divide the former British Mandate into two nations. Since then it has denounced Israeli "occupation" 2,342 times and "settlements" 256 times, as compiled by Eugene Kontorovich and Penny Grunseid. Meanwhile, it ignores or rationalizes Palestinian terrorism. In January of this year, UN Secretary General Ban Ki-moon excused Palestinian terrorism by noting that "it is human nature to react to occupation." The nation that in the past decade has invaded Ukraine and Georgia, and annexed Crimea, has no moral standing in negotiations over which territories will comprise a Palestinian state. Historically, Russia has supported Palestinian terrorism. Palestinian Authority President Mahmoud Abbas earned his PhD in Holocaust denial at a Russian university. And Russia is an avowed ally of Israel's enemies – Iran and Syria especially. Once upon a time the fourth member of the Quartet could be relied upon to defend Israel from attacks at the UN, but not under this president. Obama feigned outrage over the Russians interfering in the US election, but did little to conceal his interference in the Israeli election, sending his own campaign pros and spending American taxpayer funds in an attempt to ensure the defeat of Benjamin Netanyahu. Many interpreted the line about "building a wall" in Obama's final speech to the UN as a shot at Trump, but it seems more likely a shot at Israel. The Palestinians have refused statehood repeatedly because they cannot coexist with Israel. According to its mandate, the Quartet was created "to help mediate Middle East peace negotiations and to support Palestinian economic development and institution-building in preparation for eventual statehood." The problem is that the Palestinians have refused statehood repeatedly for one reason: they cannot coexist with the State of Israel. Yasser Arafat's insistence on a "right of return" that would flood a nation of eight million Jews with twice as many Muslims ended the 2000 Camp David talks. The stated purpose of the Quartet is untenable until the Palestinians change. As Golda Meir purportedly said "We will only have peace with the Arabs when they love their children more than they hate us." The only redeeming value of the Quartet (and the real miracle of the past eight years) is that Obama didn't turn it into a Quintet by installing Iran as the fifth member.